The Praetorian Guard  was a force of bodyguards used by Roman Emperors. The title was first used for the guards of generals in the Roman Republic. Their commander, the Praetorian Prefect, was often an important figure in the political planning in Rome. The Guard was stopped and disbanded by Emperor Constantine I in the fourth century AD. The term Praetorian derived from the tent of the commanding general or praetor of a Roman army in the field, known as the praetorium. It was a habit of many Roman generals to choose from the ranks a private force of soldiers to act as guards of their person. This elite group of Roman citizens consisted of both infantry and cavalry. In time, this cohort came to be known as the cohors praetoria, and various notable figures had one of those guard groups, including Julius Caesar, Mark Antony and Augustus (Octavian). As Caesar discovered with the 10th Legion Equestris, a powerful mounted unit was desirable in the field. When Augustus became the first ruler of the Roman Empire in 27 BC, he decided such a formation was useful not only on the battlefield but in politics also. Thus, from the ranks of the legions throughout the provinces, Augustus recruited the Praetorian Guard. Through the cunning of their ambitious prefect, Sejanus, the Guard was brought from their Italian barracks into Rome itself. In AD 23, Sejanus convinced Tiberius to have the Praetorian fort built just outside Rome. One of the cohorts held the daily guard at the imperial palace. Henceforth the entire Guard was at the disposal of the emperors, but the rulers were now equally at the mercy of the Praetorians. The reality of this was seen in AD 31 when Tiberius was forced to rely upon his own cohors praetoria against partisans of Sejanus. Although the Praetorian Guard proved faithful to the aging Tiberius, their potential political power had been made clear. While campaigning, the Praetorians were the equal of any formation in the Roman Army. Seldom used in the early reigns, they were quite active by AD 69. 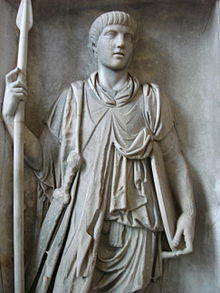 Under Domitian and Trajan, the guard took part in wars from Dacia to Mesopotamia, while with Marcus Aurelius, years were spent on the Danube frontier. Throughout the 3rd century, the Praetorians assisted the emperors in various campaigns. The relationship between the Guard and their Emperor was always sensitive. Bribing the Guard was a common theme in Imperial history. Sejanus almost took over the running of the Empire, before Tiberius overcame, and later executed, him. A number of Roman Emperors were murdered or otherwise deposed by the Guard, or with their knowledge. The first was Caligula. ↑ They saved the day in the battle against the Nervians in 57 BC. ↑ Bingham, Sandra J. 1997. The praetorian guard in the political and social life of Julio-Claudian Rome (PDF). Ottawa: National Library of Canada. ISBN 0-612-27106-4. Retrieved 2007-05-23. This page was last changed on 8 January 2019, at 15:26.